Autumn calls for an abundance of roasted root veggies! We tend to think of onions as an ingredient used in recipes to add flavor and texture, but they’re delicious on their own, too! Onions have cleansing properties that make this a valuable food to integrate into your weekly meals. Onions have antihistamine effects, which may reduce inflammation and histamine levels in the body, which might reduce one’s reaction to allergens and asthma. Eating lots of onions may also reduce glucose levels in the body to keep your sugars balanced. This recipe is a great side dish for an autumn meal, and might be the perfect side dish for your Thanksgiving spread! Save this recipe for your holiday plans next week. Slice onions into halves. Rub with olive oil, and sprinkle with salt and pepper. 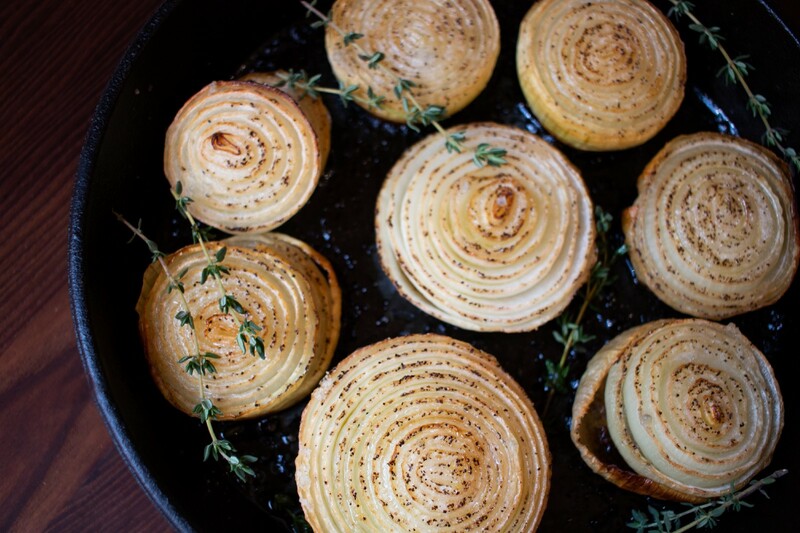 Roast at 350˚ for 30–45 minutes or until onions are golden brown. Lather cooked onions with ghee and sprinkle with fresh thyme. Enjoy!